SEAT’s biggest product offensive has reached its climax with the introduction of the brand’s new flagship model, the Tarraco. The large SUV will bring higher margins to the company, growing its portfolio and increasing its competitiveness, allowing it to cover 80% of vehicle segments in the European market. 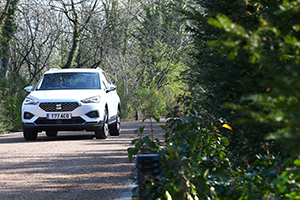 SEAT’s outlook continues to be confident and upbeat as it introduces new vehicles to its line-up and refreshes those that are already mainstays in the market, offering vehicles that suit every aspect of our customers’ lifestyles. In 2018, the brand reached a total volume of 517,600 vehicles globally, 10.5% more than in 2017 exceeding the record set in 2000. In the UK, SEAT broke yet more records selling 62,863 vehicles, 12% more than in 2017. Financial results announced at the SEAT annual press conference on 27 March exceeded all expectations. The new SUV blends the key attributes of every vehicle in the SEAT range – design and functionality, sportiness and comfort, technology and emotion – but in a form that suits a wider variety of lifestyles. The new SEAT Tarraco is designed for drivers who need the usefulness of a seven-seater and the practicality of a higher driving position but are conscious of a vehicle’s aesthetics and appreciate the Tarraco’s balance between self-confidence, elegance and sportiness. From the sculptured exterior design, high-end feel of the interior, to the advanced engine line-up, Tarraco epitomises the core values of the SEAT brand. As the SUV market continues to expand, Tarraco will play a key role for SEAT, strengthening the brand and aiding further growth at a time when the company’s sales are rising steadily. With a trio of SUVs to offer, the opportunities for expansion become much clearer, with Tarraco leading the way for the brand. Named after the Mediterranean city of Tarragona – a historic, cultural centre with awe-inspiring architecture but a spirit that is young and adventurous – the name Tarraco was chosen by a popular vote. More than 146,000 SEAT enthusiasts participated in the final phase of the #SEATseekingName competition. Bigger dimensions inspired the design team to find a greater balance between aesthetic integrity and purposeful proportions. Even though the Tarraco SUV is 4,735mm long, 1,839mm wide and 1,674mm tall – creating a huge interior space and an imposing exterior – the overall design implies lightness and agility as well as a robustness and practicality. At the front a more prominent grille design gives an increased presence and more characterful look. The sharp full LED headlights retain the company’s triangular signature, set into the body, giving a more focused appearance, and a greater sense of purpose to the SUV. Lighting technology is an important aspect of the Tarraco’s design; to this end the SUV uses 100% LED technology throughout the exterior and interior as standard on both the XCELLENCE and SE-based trims. This technology has given designers greater creative freedom to highlight and extenuate the SUV’s design, while at the same time the driver benefits from cleaner, crisper lighting. From behind the driver’s seat, looking out over the front of the car, its size is subtle and the design team has worked hard to make Tarraco appear smaller and less intimidating, with intelligent use of shapes and lines in the bonnet. Aesthetics may be of huge importance, but an SUV also has to be a practical, functional vehicle, which is why the emphasis at the rear of the Tarraco has been placed on a low loading area, with a design to express the width and practicality of the SUV. The LED lighting also allows for dynamic rear indicators, another technology that highlights the continual mix of form and function in the Tarraco. No matter which colour the customer choses from the abundance of options – Dark Camouflage, Oryx White, Reflex Silver, Atlantic Blue, Indium Grey, Urano Grey and Deep Black – the shape, stature and presence of the SEAT Tarraco remains evident. That balance is maintained across all trim levels. Inside, designers have worked hard to create an interior that cocoons occupants, using a horizontal line that spans the dashboard and emphasises the width of Tarraco, increasing the feeling of space in the cabin while at the same time inspiring confidence. The interior offers the form, functionality and quality that is a necessity in today’s competitive marketplace. The SUV’s interior design exudes a level of quality normally found in the premium sector, mixing different materials to evoke a feeling of confidence no matter which trim level is chosen and which specification is selected. Perfectly sculpted, the cabin balances the differing needs of the driver and passengers, providing a driver-focused, ergonomically designed seating position when behind the steering wheel and a relaxed, comfortable environment for passengers whether sat at the front of the SUV or in the second row, thanks to the generous internal proportions for both leg and head room. Even at the very rear of the vehicle there is sufficient space for the third row passengers. The precision applied is tangible, most notably in the design and positioning of the infotainment system and SEAT’s Digital Cockpit with a 10.2 inch screen. The central 8-inch infotainment display floats, rather than being integrated into the dashboard, not only helping to minimise intrusion into the cabin, but also allowing designers to place it in a more ergonomic and prominent position, closer to the driver’s eye line, making reading information from it or the cluster simpler and safer. The interior’s design is perfectly supplemented with high quality workmanship and carefully selected materials and colours – a choice of textile, Alcantara® or black leather seats, and an elegant, sporty black interior roof – with tactile precision of the switches and controls demonstrating the utmost attention to detail. incorporating Android Auto® and Apple CarPlay®. The Tarraco not only benefits from the clarity and connectivity of the central Infotainment system, as the large SUV also integrates SEAT’s versatile and customisable Digital Cockpit too, providing clearer information to the driver, and helping them keep their eyes on the road. The 10.2 inch digital display is an interactive, customisable pixeldense digital instrumentation cluster that not only has a modern and versatile design, but provides greater functionality, allowing drivers to view everything from classic information found on analogue dials, such as speedometer and tachometer, to fullcolour maps and navigation. Controlling the information provided is simple and requires the driver to merely press the steering wheelmounted ‘View’ control button to scroll through the three different available main displays, minimising driver distraction and maximising the clarity of information provided depending on the driver’s needs. Transitions between the available information on the 1280 x 480-pixel TFT display are smooth thanks to its 75Hz refresh rate, which makes information easier to read, further helping reduce driver stress. Performance, efficiency and reliability are key to the Tarraco’s powertrain line-up with all the engines powering the large SUV benefitting from direct-injection, turbocharging and start-stop technology with outputs of between 150PS and 190PS. a compression ratio of 10.5, and give the Tarraco a top speed of 125mph. The larger 2.0-litre TSI engine benefits from a bore of 82.5mm and a stroke of 92.8mm with a compression ratio of 11.65 and produces its maximum power output of 190PS between 4,200rpm and 6,000rpm. The engine’s enormous amount of torque, 320Nm, is delivered at 1,500-4,100rpm. The larger petrol engine helps the Tarraco reach 62mph in just 8 seconds and gives it a top speed of 131mph. There are two diesel options, both 2.0-litre TDIs, with power outputs of 150PS and 190PS respectively. Bore and stroke are identical at 81mm and 95.5mm but the compression ratio differs: the 150PS unit uses a 16.2 ratio while the 190PS engine is 15.5. The 150PS variant can be connected to either a front-wheel drive, six-speed manual or seven-speed DSG with 4Drive system, but maximum power remains 150PS at 3,500-4,000rpm and maximum torque of 340Nm is available from 1,750rpm and 3,000rpm. The 190PS variant is connected to a sevenspeed DSG with 4Drive system, and the maximum power remains 190PS at 3,500-4,000rpm and maximum torque of 400Nm is available between 1,750 and 3,250rpm. Overall performance in the two-wheel drive version is gratifying with a top speed of 126mph and a 0-62mph time of 9.8 seconds. Even in all-wheel drive format the Tarraco is still no slouch with a top speed of 123mph and an identical sprint time. The higher-powered diesel engine is solely available in 4Drive/sevenspeed DSG gearbox format. And with 190PS/400Nm at the driver’s disposal it performs splendidly no matter what the driving conditions are or the demands placed on it. Performance is striking with a top speed of 130mph and the ability to reach 62mph in only 8 seconds. As new technologies come online the SEAT Tarraco is engineered to benefit from alternative powertrain technologies, improving efficiency even further in the future. In this regard, by 2020, the Tarraco will benefit from a Plug-in Hybrid version. The SEAT Tarraco has been engineered for drivers looking for both excitement and functionality from one vehicle: people who need the practicality of seven seats and the space to transport family and friends, but appreciate a vehicle that reacts to the driver’s inputs and offers dynamic performance. The key to its nuanced approach to practicality and dynamic behaviour is the latest technology from Volkswagen Group and the MQB-A long wheelbase architecture that underpins the large SUV. At the front, the SEAT Tarraco integrates an independent MacPherson strut suspension system with coil springs and hydraulic shock absorbers, while at the rear a multilink approach has been used, also incorporating coil springs and hydraulic shock absorbers. With the SEAT drive profile, the driver can select which setting they prefer – Normal, Eco, Sport and Individual and 4Drive versions include off-road and snow modes. Whether the Tarraco is specified with 17-inch alloy wheels, or the largest 20-inch matte machined-alloy wheel options, the chassis offers the maximum amount of quality, and nowhere is this more evident than in the steering. The driver is able to feel the road thanks to the perfectly weighted steering which uses a rack electric power system to provide assistance, but without numbing the experience, instead maximising feedback and driver enjoyment. The result is a nimbleness and lightfootedness that few would expect from a large SUV, but the Tarraco, with a wheelbase of 2,790mm and a weight as low as 1,634kg, manages to perfection, making it not only a practical, every day vehicle but also an SUV that can bring enjoyment to the driver. The SEAT Tarraco brings high levels of safety across its trim line-up as standard to ensure that the vehicle can adapt to any incident that may occur. Front Assist with Bicycle Detection, Lane Assist, Tiredness Recognition and Emergency Call are all standard throughout the range. Add to these systems the convenience features also included – Park Assist, Electric Tailgate with Virtual Pedal and Top View camera system – and the SEAT Tarraco stands high amongst its competitors in the large SUV market.